Superb presentation skills business training in Newbury, Berkshire and across the Thames Valley. 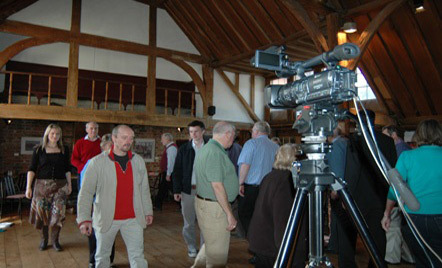 Our corporate training projects use drama techniques to assist businesses in areas such as communication skills and team development. 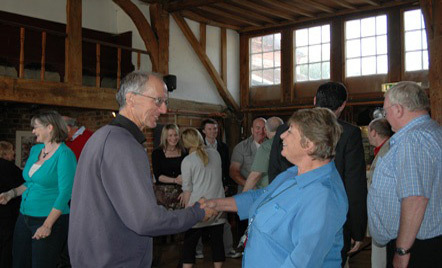 Recently we have worked with politicians, accountants, solicitors, and teachers to provide instructive and enjoyable days away from the office in The Watermill’s uniquely peaceful location. Each project is tailor-made to fit the precise needs of your business. Prices vary according to the demands of the training, but many businesses have found us to be highly affordable compared to bringing in companies from further afield; so if you are based in the Thames Valley, Berkshire, or the Newbury area you will find our prices extremely competitive. Actors spend years training to control every aspect of their image so that they can deliver a brilliant performance each night. So at The Watermill you can be confident that you are learning from dedicated experts who really know what it’s like to be in the spotlight. Not only that, but the training is delivered in a supportive, positive way that will boost confidence and self-belief. We tailor our training to suit your particular needs or tackle problems specific to your business. We use actors to role-play employees or staff as a training aid, providing an invaluable chance to practice new techniques. Examples of areas we have focused on are: Impact in Meetings, Interviewing Skills, Elevator Pitches, and Difficult Conversations, but please call to discuss if you have your own specific ideas. These workshops are primarily about fun and collaboration. It’s a unique chance for staff at all levels to learn an unusual, performance-related skill together, taught by an experienced professional. All our workshops are practical and active, and colleagues are encouraged to work together in a relaxed, unpressured environment. Stage combat - Discover how fights are created onstage and in films, and have a go at throwing a few fake punches. Salsa - Release your inner cha-cha-cha and learn some easy, spicy, dance moves! Drama games - Have a go at some of the hilarious and outlandish games that actors get up to in the rehearsal room. "The facilitator - what a diamond! Brilliant, interesting and very well paced training." "A very useful session, well managed and delivered." "Lovely trainer - very infectious and charismatic. I found the training so helpful, thank you."